The human race has traveled across the galaxy to find another planet for us to live on as Earth was running low on resources and the population was growing constantly. They have found a viable planet not so far away and they have established a base there, when suddenly the inhabitants attacked. 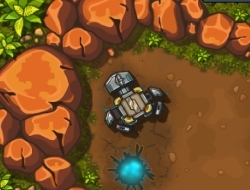 They are small creatures you need to defeat in this defend game and luckily you have enough turrets to do this. Choose a difficulty you think you can handle and start building defense systems all over the place as they come in groups of many dozens and they will attack any foreign technology. Dont let them get past your walls of turrets or the planet will never be a good alternative to Earth. Use the mouse to place turrets, repair and upgrade them. The Last Shelter 0.00 between 0 and 10 based on 0 votes.